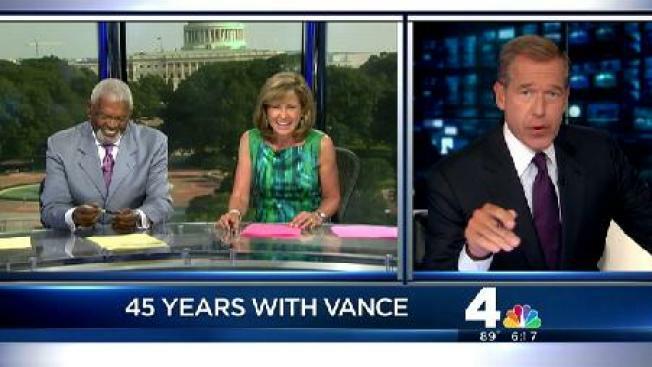 As the congratulatory messages continue to pour in, NBC Nightly News Anchor Brian Williams took some time out to share his special -- and hilarious -- memories of News4's Jim Vance as Vance celebrates 45 years at WRC. "I first remember watching him as a small child," Williams joked. "I think he'd already been on the air for 20 years." Williams continued to poke fun at Vance's anniversary, adding, "My parents would tell me about the day he broke the news about World War II. That was his voice, I think that's his voice on the Hindenburg. That great line Jim had, and it's been a while since he's had one, 'Oh, the humanity.'" Williams then shared his favorite moment in Vance's career; when Vance and News4's George Michael couldn't stop laughing when a model took a spill twice on a catwalk during Paris Fashion Week. As Vance watched the video years Monday evening, he cracked up again. "You know, still works," Williams said. "That combination. That's what it takes to get to Jim after all these years."